Last week in my American Government class my teacher brought up how Sen. Kerry think that it would be a good idea to cunsult the UN about all America's choices. THen he said, say we did cunsult the UN...and the majority of the countries in the UN voted that America had become an "aggressive Nation"...How would you feel if another country "occupied" us to make sure that we didnt become more aggressive? ISIS-In a way our war on terrorism is all about preventing an enemy from occupying our streets. Occupation usually implies an army invasion much like we're doing in Iraq, and what we did in Europe and Japan after WWII, after the allied nations drove the Germans and Japanese out of the countries they invaded. Occupation is also what Saddam did in Kawait in 1991 and tried to do to Iran before that. These terrorists are just a different kind of army clustered in Cells and with a much less formal means of communications than a normal army...are they out there even now, occupying our citys and towns right here in the US of A? I believe so, and I worry. We can't see them, they're hard to find and because we don't believe and act like they do they consider us the great Satan. Their goal is to destroy us and everything we represent to them. They'll beat us to our knees until we succumb to their beliefs. Just to play Devil's Advocate.....couldn't it appear as though we are doing the same thing in Iraq? You should ask someone from Northern Ireland as we (The UK) occupied them for the last 400 years. They felt so badly about it they became terrorists whereas they called themselve freedom fighters, which they were to a degree because they wanted there freedom. Fair enough to be honest. I'd have kicked up if some nation of self righteous gits invaded me and told me how to live. Please don't compare WW2 to anything thats gone on recently. It was totally different. We didn't occupy, we rebuilt two nations we destroyed (rightly or wrongly so) and it was also political as we didn't want the USSR getting there fingers in any more pies . The picture is allot bigger than it seems. Also Iraq has nothing to do with terrorists before the US went there. It's been proved beyond doubt Al Queda and Saddam didn't get along. Even the US government has admitted terrorism is up, not down after Iraq. Neither did the US government goto Iraq to stop terrorists, there official line was to stop WMD's being made or used (which Saddam didn't have any way). Please read up about Iran and Iraq. They had a war, they hated each other. It wasn't one sided, I don't know where you got that from. That's totally incorrect. The problem with the war is the MISINFORMATION going around out there. Here's an article, one of MANY, which I happened to have in email. It wouldn't convince me either....the people who are actually in the war or work in the military are the ones who know the truth. UNMOVIC acting executive chairman Demetrius Perricos told the council on June 9 that "the only controls at the borders are for the weight of the scrap metal, and to check whether there are any explosive or radioactive materials within the scrap," Middle East Newsline reported. "It's being exported," Perricos said after the briefing. "It's being traded out. And there is a large variety of scrap metal from very new to very old, and slowly, it seems the country is depleted of metal." "The removal of these materials from Iraq raises concerns with regard to proliferation risks," Perricos told the council. Perricos also reported that inspectors found Iraqi WMD and missile components shipped abroad that still contained UN inspection tags. He said the Iraqi facilities were dismantled and sent both to Europe and around the Middle East. at the rate of about 1,000 tons of metal a month. Destionations included Jordan, the Netherlands [that's Holland, for the geographically challenged] and Turkey. The Baghdad missile site contained a range of WMD and dual-use components, UN officials said. They included missile components, reactor vessel and fermenters ÃƒÂ¢Ã¢Â‚Â¬Ã¢Â€Âœ the latter required for the production of chemical and biological warheads. "It raises the question of what happened to the dual-use equipment, where is it now and what is it being used for," Ewen Buchanan, Perricos's spokesman, said. "You can make all kinds of pharmaceutical and medicinal products with a fermenter. You can also use it to breed anthrax." The UNMOVIC report said Iraqi missiles were dismantled and exported to such countries as Jordan, the Netherlands and Turkey. In the Dutch city of Rotterdam, [in Holland] an SA-2 surface-to-air missile, one of at least 12, was discovered in a junk yard, replete with UN tags. In Jordan, UN inspectors found 20 SA-2 engines as well as components for solid-fuel for missiles. "The problem for us is that we don't know what may have passed through these yards and other yards elsewhere," Buchanan said. "We can't really assess the significance and don't know the full extent of activity that could be going on there or with others of Iraq's neighbors." UN inspectors have assessed that the SA-2 and the short-range Al Samoud surface-to-surface missile were shipped abroad by agents of the Saddam regime. Buchanan said UNMOVIC plans to inspect other sites, including in Turkey. In April, International Atomic Energy Agency director-general Mohammed El Baradei said material from Iraqi nuclear facilities were being smuggled out of the country. er...you've been had. those WMD components were missiles capable of carrying WMD's. They weren't WMD's. Thats a very cleavely worded peice of fact to make it look like they were WMD's, only weapons capable of there delivery. Nothing in that statement says they had WMD's, just the bits to make them and deliver them. MASSIVE, huge difference. Also before the war, Iraq agreed to destroy these missiles, but then the US started building up in Saudi and Kuwait. Now If I was backed into a corner I'd consider fighting back to. In fact I would, no holds barred. Also noticed none of this would have been shipped abroad if they US and UK hadn't built up for war there. Its a double edge sword. You think people in the military know the truth? Look back over the last 60 years, drug trails, Nuclear trials where soldiers now are dying of cancer because they were exposed to blasts or ordered to go into the areas after wards to do excecises. Depleted Uranium, thats a biggy, thats gulf war syndrome cause by the dust after the round hits. Agent Orange, look how many people die of that a year still. Nothing I originally said was in the slightest bit untrue! This thread started with the question "how would we feel if our streets were occupied?" Now we're off on Iraq. OK, but first in regard to the original thread. Yes I'm paranoid, I see much more information than what shows up on TV or in the newspapers and I'll freely admit it. Thanks for you quick observation of one of my finest character traits. Next lets address my being a product of Fox News. Yes, I watch it, and CNN, CBS, NBC and ABC. Don't lay a guilt trip on me because I happen to include them in my daily entertainment plan. Tell me honestly that you don't input information from BBC. Next you say "Please don't compare WW2 to anything thats gone on recently. It was totally different". Thats a true and honest statement but you're talking out of both sides of your mouth. You also say "You should ask someone from Northern Ireland as we (The UK) occupied them for the last 400 years". Are you telling me that that's not totally different? You also mention agent orange, nuclear testing and a whole litany of nasty things. Hummm...I can't mention WWII yet you can reference a historic list spanning more than half a century to make your case...You have a double standard. You go on to say "Please read up about Iran and Iraq. They had a war, they hated each other. It wasn't one sided". All I can say is; Brilliant Sherlock, go back and read what I originally said in my first post. You also referenced WWII saying "We didn't occupy, we rebuilt two nations we destroyed (rightly or wrongly so) and it was also political as we didn't want the USSR getting there fingers in any more pies . The picture is allot bigger than it seems". Thanks for the history lesson and another application of double standard, rightly or wrongly. Moving on, yes terrorism is up, not down after Iraq. What would you expect differently? A region-wide bunch of fanatics are clustering up to prevent us from succeeding. They know that with every success we have their world shrinks and they lose capability in accomplishing their goals. I say great, let them cluster up, they're easier and cheaper to kill. You also state "Iraq has nothing to do with terrorists before the US went there. It's been proved beyond doubt Al Queda and Saddam didn't get along." Maybe you misspoke and meant Bin Laden and Saddam didn't get along or maybe you really meant that nobody in Al Queda got along with Saddam. I'm confused about what point you're really trying to make here but the way you state you fact makes it irrelevent. Based on all your gathering of segments of Anti-Iraq war talking points I suspect you're an activist just waiting to spring on some unsuspecting kid. Reread what I said in the first post and come back on subject. You are well spoken enough to give the kid some insight to her question. I use bleach to remove stubborn grass stains. Personally I know better then to wade into this so I won't, only because we have some really good people on this site with valid view points on either side who I consider friends and aquantinces, I wouldn't want to change that for the world. My only point is, with the upmost respect to everyone involved, I see a lot of nit-picking and not a lot of fact stating and I think it would be better if everyone approached the subject less emotionally and a little more respectfully. My own views are that of Mondo's but as I said, I'm staying out of it, not for a lack of knowledge or the will to speak but for the sake of maintaining the peace. Thank you all for coming, enjoy your stay! I think what I find the biggest problems lie ...is that Person A and Person B are not getting the same information. I find that disturbing! We should have a media which give FACTS ...not OPINION and this would eleviate a multitude of problems. Through the past months, I've talked to MANY people online and in person. I've found that their "stand" almost always lines up with their news source. I would NEVER cut down the UK...I happen to love and respect you guys greatly.....BUT if all you are hearing is the BBC and Al Jazeera News....why in the whole wide world....would you assume you are hearing a TRUTH? I challenge you to question your NEWS SOURCE as much as your GOVERNMENTAL decisions and I think you may find a different aspect. I hear people hate Tony Blair...and never understand....due to the fact I happen to think he's one of the greatest leaders ever. He has classified facts.....and makes decisions accordingly.....REGARDLESS of popular opinion. THAT takes balls folks! Check him back out in a different angle....you may see a different person! Why would I need to jump on some kid about this? I'll let them make there own minds up. Im no activist or left wing liberal, Im just seeing things how they are. Your original statement is one of paranoia and is complete bizarre. Theres no terrorists on your streets, apart from 9/11 and the bomb in the car park what was the other major US terrorist attack on US soil? who did it? Just cause I think the war was stupid doesn't make me an activist. If I was and activist I'd have come back with more points, more facts rather than a point of view, totally different. Do you think that the rest of the world are all activists? Cause most of the rest of the world doesn't agree with this war. Would you say the 2 million people who marched on westminster, London before the war were activists? No, there common people excercising there right to protest against what they feel is wrong. Sorry but THAT is democracy in action. Ignoring the world and going to war illegally anyway, that NOT democracy. Thats what the USSR did in the 50's and 60's. Again I blame US media for branding those against the war activists, liberals etc. You've more than proved that point. Im not activist, I don't march about being a do gooder, I just feel very strongly about this topic. What I refer to isn't double standards. I refered to WW2 in a different context. This Iraq was is nothing like WW2 and I told you why. Where is the double standard in that? It was totally different to Iraq, are reasons for being there is totally different. I didnt say you can't mention WW2 either, you put those words in my mouth. I said don't compare them. BTW Northern Ireland was different, it started out based on religeon, and still partly is as much as national boundries. Iraq is allot different. Thats someones house! 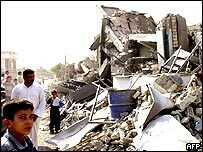 Regardless of what the US thought was in there when it was bombed by them from the air, thats a house, in a street where people live. Imagine if someone came to your country and daily flew over your city and bombed your neighbours. What would you do? I know what I'd do. Civilians - They want to get on with life but who they gonna support. The White anglo saxon christians, or there own countrymen. Theres no point argueing this as your stuck in your point of view and can't see this from both sides. Merika, come live in the UK and experiance Tony Blair, you'll hate him soon enough. He doesn't have facts, its been proven in 2 reports that he used unconfirmed MI6 information that MI6 even said was dubious. Even government scientists who worked in the Ministry of Defence said it was dubious, 1 spoke to the BBC about it and then was found dead in an aparent suicide but medical experts questioned that as it was far beyond a questionable death. That was Dr. David Kelly. Its not about cutting down the UK or US, its about disagreeing with your leaders, I don't cut down the US, I cut down the administration. There is a huge difference. If people can't see that then Im not going to bother talking about this any more and people can live in there world of false patriotism and ignorance (re The Georring quote). I do read the BBC, I do read Jazeera, I do read Fox news, mainly cause its funny and tells the news in a very odd manner, but I read all sorts of things from mailing lists, forums, other news stations. I also have personal freinds in the US, France and Germany who send me things to read. I have a pretty wide range of news but theres one things above all else thats important, no matter who says what about a given story, it only happened once and theres a right and wrong way to tell that story. If people with opposing view points didn't feel passionately about them....there wouldn't be any wars in the first place. As long as there is a war going on....you are going to have two sides. That's what war is about. People are never going to agree on everything. You don't have to fight if you disagree! You talk it over, reach a comprimise. Before the 20th century most wars were either religeous based or gains in territory. Not about disagreements. I've done my British history and we were the guys who had the largest empire since Rome which collapsed in 400AD and did all the invading in the last 300 years prior to 1914. Thats a fact. And it was about land and about money. If people disagreed we bought them out, thats how we got india and pakistan . Be bought the Raj. Before the 20th century most wars were either religeous based or gains in territory. Perhaps, at that time, there really wasn't anything else to argue about. lol! Talking and compromise is good. It doesn't always work though. Mondo-I've read a lot of your posts note that you write well and possess a darn good knowledge of history combined with a good awareness of current events. I also note that you Spin the details to support your own arguement. This thread began when ISIS asked "how would we feel if our streets were occupied?" and I posted a reply projecting the idea that in a way our streets were occupied, just not in the traditional sense. I was up front and honest and based it on what I know to be true. Now you on the other hand posted back to me that I was Paranoid and a product of Fox news and then proceeded with a lenghty dialog about the war on Iraq with absolutely no response to the original question. Whats up with that? It certainly was apparent that you wanted to project your anti-wars view. Here's some of your other comments you use to support your view. Freedom fighters-your defination is spun to make it appear that Iraq's who've suffered in this war are taking up arms. I'd have to ask, how many Iraqi's suffered under Saddam and because of this war have taken up arms? I'd be betting its a very small percentage. Religeous fundementalist-we are know there are some but at the same time how many fit your discription? Again I'll bet on a small percentage. Civilian-I assume you mean anyone not fitting the previous labels. This is the group that suffered under Saddam, are suffering now and are just waiting to get on with life, just as you said. I think we of the free world should be united in getting this fight over with, installing a representive government and then letting them deal with their internal differences. I expect they can and will...Much like Turkey. "Your original statement is one of paranoia and is complete bizarre. Theres no terrorists on your streets, apart from 9/11 and the bomb in the car park what was the other major US terrorist attack on US soil? who did it?" Ignoring your comment about paranoia and completely bizarre, I'll address the terrorist issue. In my occupation I work closely with many law enforcement agencies and first responders. I get exposed to much more information than whats in the papers. Enough said about that, I'll get back to the terrorists. I'm not going to spend the time to be precise but folks will remember the news reports. 1. In a coastal city, not long after 9/11 a storage unit and van were found that happened to be filled with explosives. 4 city blocks were evacuated while this material were dealth with. It wasn't a construction company. 2. How about the Islamic cabdriver that shot up the LA airport. 3. How about having the plans to a number of our high schools being found on a computer in Iraq. 4. How about Richard Reed, the shoe bomber. While not on US soil the plane was destined for the USA. A BIG BOOM DOES NOT A TERRORIST MAKE...ITS A STATE OF MIND. Enough said and like you pointed out "Theres no point argueing this as your stuck in your point of view and can't see this from both sides." Thats something that applies to both of us, not just me. I also note that you Spin the details to support your own arguement. I think everybody's guilty of this at one time or another. If we all just stuck to the facts then there would be no such thing as political debate, or debate for that matter. The other problem is that no matter how much you know, someone always knows more. I'd think more Iraqi's have died to due sanctions since 1991 that have died under Saddam in that time 1991-2003. Don't get me wrong, im glad to see the back of him and In that respect the war is justified. But the BS politics, excuses, defying the UN, that was bad, very bad and the misinformation led to Britian helping out, the 45 minute claim which was completely untrue. Freedom fighters? Terrorists? What they call themselves may not be what we label them. Those guys cutting off heads, there terrorists, but those guys defending Sadir city I think would call themselves somthing else. Its not some state of mind, belive me, I've seen enough interviews with IRA and dissedent Irish and nationalist groups to know that many of these people are normal people who've taken up arms for one reason or another and its simply not to kill people for fun. BTW I do disagree with them, I hope I've made that clear as terrorism has played a large part in my life already so I probably have somewhat of a different attitude to many people in the US about it. And my first post stated how I'd feel about someone occupying my streets. I said I'd kick off about it. Now does that make me a terrorist? Or a freedom fighter? What exactly does "kick off about it" mean? Now does that make me a terrorist? Or a freedom fighter? Mondo, wouldn't that depened on if you are supporting a cause of honor or supporting a cause of making fear so someone would listen to you or you could make a point. Killing people would not make a point unless you were defending yourelf. Right? Kick off: take up arms and fight back. It depends how you look at it. If you don't think your gonna be listened to do you just sit there and take it or do you do somthing more extreme? I guess for me its all about the situation. If my country was occupied because we lost a war that we started then it might well be different and I'd accept it and get on with life. If it was occupied because of an unjust war or invasion i.e. Germany and France 1940 i'd probably take up arms (if I was French....god forbid! ) as thats a matter of honour. Think of the French resistance of WW2. They would destroy anything German or Vichy French. They were freedom fighters, fighting occupation. While I don't like to compare this war with WW2, in this respect you can compare to some degree. Im not condoning anyones actions but looking back on history you can draw some comparison. As I say it really depends on the situation. If Canada was ever occupied by an invading army we'd be screwed because you can't get a firearm up here unless you're a cop, criminal or have a valid FAC (Firearms Aquisition Certificate). Even if you do have a FAC, you only have access to certain firearms. The biggest you can own here is a .22 unless you have a very special license for a shotgun (only shooting clubs can apply). Apart from that only the police can use guns. They were all banned here in the 90's. I can't see the UK being invaded though or the need for me to own a gun. I can't see Canada being invaded any time soon myself. We could be invaded by a bunch of rabid squirrels and still not be able to defend ourselves. I'd watch out, Canada has huge oil reserves!